How do I join up? Spatial neglect is a common syndrome following stroke, most frequently of the right side of the brain. Such patients fail to be aware of objects or people to their left. For example, when searching through a visual scene, patients with left neglect tend to look at elements on the right only. Patients with spatial neglect can see all the items in a scene, but they have problems allocating attention correctly over these objects, especially as the scene becomes crowded. Above shows the responses of a patient with spatial neglect of the left-side. Their task was to identify the letter A in each scene by putting a ring around it. In the first scene (top left) they have no problems finding all the As. 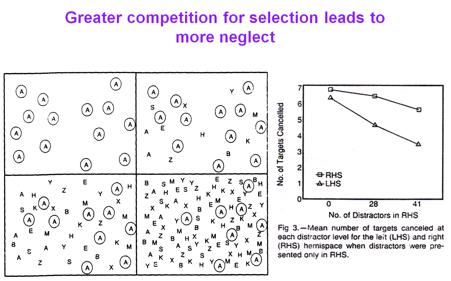 However, as the scene becomes more complex, with distracter elements added in (other letters), the patient picks up fewer and fewer As, with a bias to only finding those on the right, hence "left-neglect". The syndrome may also involve ‘personal’ space, with patients neglecting their own body parts. Importantly, many patients are unaware they have these problems. Perhaps unsurprisingly, therefore, enduring neglect is a poor prognostic indicator for functional independence following stroke.